Nuclear decommissioning and the disposal of nuclear waste is a complex and dangerous process. Current estimates suggest that the UK nuclear clear up could take in excess of a century and such is the complexity of the procedures involved, certainly so within high gamma radiation environments, we are not able to satisfy stringent health and safety requirements by manual processes alone. If we explore the conditions in which the tasks applicable to decommissioning, testing and dismantling exist and the measures taken to ensure the safety of operatives; consider the work wear which must be worn to protect against potential contamination, and it becomes clear why the adoption of industrial robotics is becoming more favourable. Air fed suits atop a leather overcoat are a must, in the least, as a means to protect against contamination, as are layers and layers of gloves. The layers and weights of such are stressful to say the least and reduce any flexibility of movement. A critical element certainly so when considering the use of power tools needed to cut and store contaminated waste. It has therefore been necessary to adopt automated robotics as a means to not only undertake such tasks, but also as a means to remove the human element from such dangerous processes. If we were to continue to attempt to complete our decommissioning commitments it is estimated that circa. 1million suited human entries into nuclear facilities will be required. Despite the safety measures adopted to try and safeguard these individuals, statistics dictate that a higher number of human entries will ultimately mean a higher number of injuries as a result. Our articulated friends provide us with the means to conduct vital, yet dangerous tasks, from a distance. Several tools have been developed that enable safe handling of waste materials, some of which, due to insufficient documentation in the early developmental days of atomic energy, are still to this day unknown or levels of contamination known. Waste that is potentially so dangerous if it did come into contact with humans that remote manipulation and handling are the only safe handling options. Automated and integrated robot control utilising joystick control is providing some of the UK’s largest nuclear reprocessing and decommissioning sites, such as Sellafield, the ability to reprocess atomic fuel from other UK and international reactors safely and efficiently. 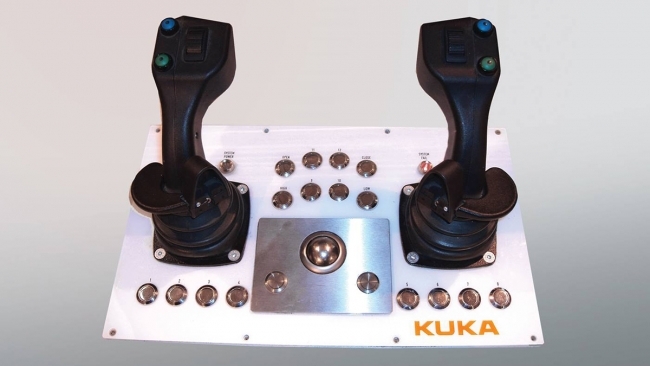 The KUKA joystick control is unique within the nuclear decommissioning market. It has been developed to seamlessly interface with the robot. The solution provides a high dexterity of movement and can be applied manually (operator moving the robot arm) in automated mode (a series of preprogramed paths) or a combination of the two providing both improved flexibility and operational efficiency. Remote operations and robotic systems play a vital part in reducing the exposure of personnel to ionizing radiation. 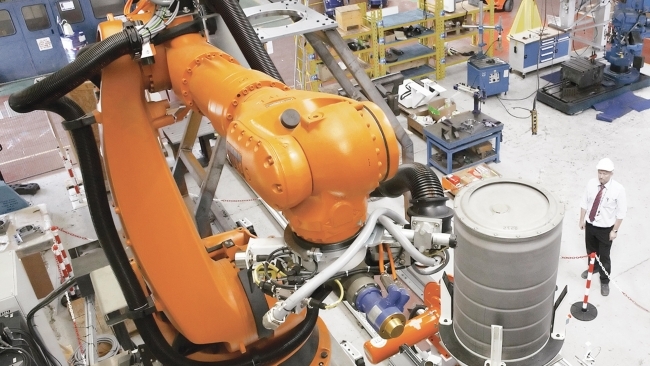 KUKA’s nuclear decommissioning solutions adopt proven industrial standard technology to suit the unique and often complex challenges of this industry, making us the only off-the-shelf nuclear compliant robotic systems manufacturer. KUKA’s global nuclear decommissioning centre of excellence, based in Halesowen in the Black Country, is developing nuclear engineering solutions along the complete nuclear fuel cycle, from mining and enrichment to conversion, in collaboration with the NNL: National Nuclear Laboratory. Many legacy facilities have extreme radiation levels. Such environments mean that robust solutions are needed but equipment can potentially fail. This could have posed a significant challenge to KUKA. Do we create robust machines designed to withstand such harsh conditions, or create a single use alternative? The KUKA range has been designed to withstand all manner of hostile environments. Consider the explosion resistant variant, the wet room variant and that designed to withstand temperatures as low as minus thirty degrees. Nuclear is no different. We use the very same models that are installed within everyday industrial environments. We simply ensured that, in the rare event of a failure, the operative was able to re-establish contact with the robotic arm through the joystick, axis by axis, manually over riding any autonomous functionality until such a time that autonomous mode could be re-enabled. However, within an environment as adverse as that within a nuclear decommissioning site we needed to be aware of contamination and the likelihood that machinery could potentially fail. Replacing entire systems is not an option. Neither is maintenance (for obvious reasons). So systems needed to be robust and flexible to enable the continuation of decommissioning activities. The work around? Robots replacing robots. Once contaminated a robot cannot be salvaged and is treated as waste as are the materials that it had been installed to handle. A new robot is installed and will disassemble its predecessor and dispose of it, along with other nuclear waste. The combination of joystick control and end effector/equipment enables a multitude of tasks to be completed. From lid removal and waste levelling to waste retrieval, all from the safety of a control room. Automatic tool change options can also be incorporated into an application meaning that more than one task can be addressed within any given environment. Incorporate into such applications a predefined swabbing routine (swab tools are designed with compliance at pre-determined rates) and you have a self-sufficient robot cell that can address multiple tasks within the decommissioning process, safely and efficiently. Online tools that are now readily available provide analytical data that can be measured to ensure that any abnormalities in radioactive output (swabbing a perfect example of this) can be closely monitored to ensure minimal risk is posed to personnel on premise and to the wider public further afield. 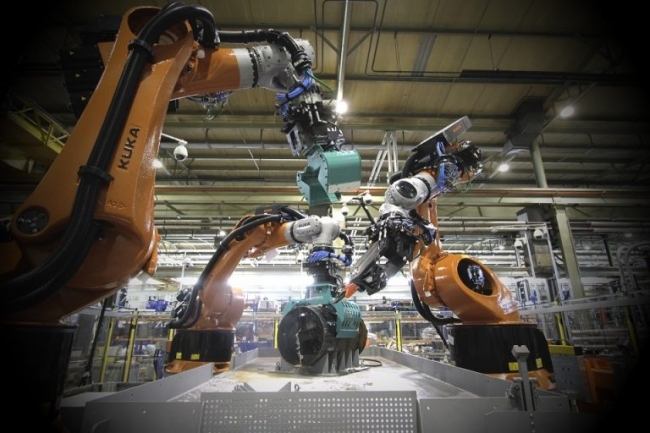 Such data can also be scrutinised that provides visibility of robot performance (KUKA connect). Any digress in efficiency can be captured early and the relevant steps taken to ensure continuation of performance. Nuclear waste is a problem of huge societal importance. Legacy nuclear waste material needs to be identified and stored until such a time it is no longer deemed a threat. The R&D (research and development) within automated robotics and nuclear decommissioning is set to increase as the UK takes steps towards achieving its decommissioning goals. Until such a time, we anticipate an upsurge in the adoption of automated robotics as the legacy nuclear waste clean-up continues.